Some memories come back to you by something you hear, like a song or an accent from someone talking nearby. Others by a certain scent - cologne, a flower, the smell of a school book. And others by the memory of a taste. My grandmom on my mom's side made the best homemade sauce (yes, it's sauce, not gravy, in my family). She would cook chicken in the sauce which gave it a flavor so different from sauce cooked with meatballs. 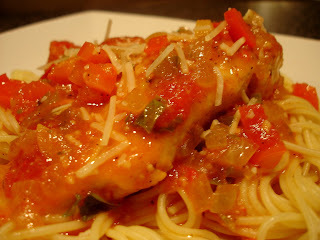 I can still remember the exact taste of the sauce, and that memory is what made me want to cook chicken cacciatore. Add chicken to pan and cook for about 4 minutes per side. Remove to a plate. If the pan is very dry, add a touch of olive oil. Add onions, peppers, and garlic and saute 2-3 minutes. Add bay leaf, a touch of oregano, and a touch of dried (or fresh) thyme, and return chicken to pan. Cover most of the way and let simmer for 30 minutes, adding basil about 5 minutes before serving. Remove bay leave and serve chicken over pasta. Garnish with Parmesan cheese. Stacey will be very, very honest with me about what she likes and what she doesn't. She loved this one so much and even said it smelled and tasted like something from a restaurant. I was equally impressed. The sauce takes on such a unique flavor by cooking chicken in it - it's hard to explain, but maybe rustic is the right word for the flavor. Rustic, comforting, fresh, light, but hearty at the same time. And even better, it smelled like my grandmom's kitchen in my kitchen, and that's a comforting smell. That looks really good. I hated chicken cacciatore when I was little for one totally lame reason: my mom used chicken pieces that still had bones and it was really hard for me to eat! I like that you use boneless skinless chicken breasts here! That looks delish, and I'm so anxious for the weather to cool down so I can make some of these one pot meals. It's still about 105 here daily. YOur tofu dishes look soooo good, too. I love chicken cacciatore! I haven't made it in awhile, but now that it's in my head might have to soon! I agree, there are some scents, tastes etc. that truly bring back memories... seems many memories are tied to food! Mmm...I've been thinking about making this soon, so now you've gone and really inspired me! This looks delicious. oh, this looks delicious. it's definitely starred for a cozy fall dinner! This was absolutely incredible! Every dish I've tried from your blog has been wonderful. Thanks for a great recipe! We tried this tonight and it was fabulous! Your website is one of my favorites, you're a great cook and have some wonderful recipes! We loved it!